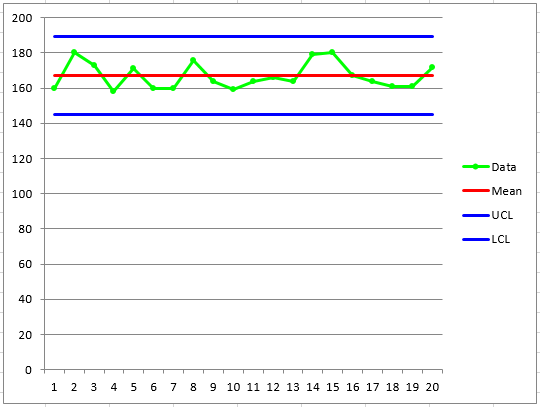 How to Create/Make a Control Chart in Excel VBA - [Download PDF]! How to Make a Control Chart with Excel VBA! 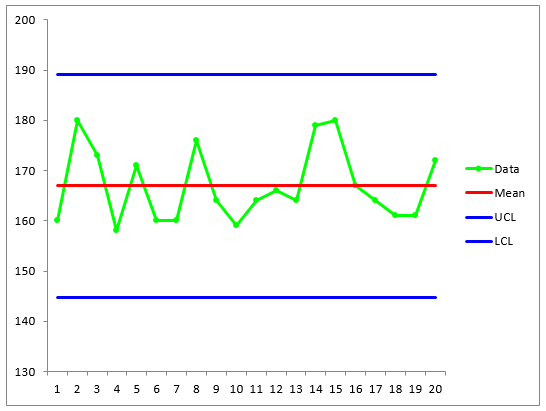 In this article, I will show you How to Make a Control Chart with Excel VBA. 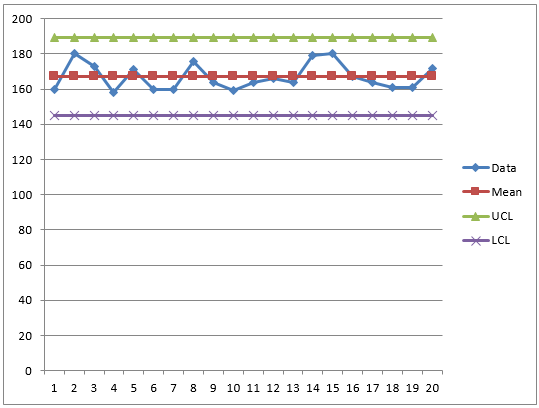 Control charts are widely used to monitor process stability and control. And a lower line for the lower control limit. If a process is stable and in control, the process data will fall within control limits. Otherwise, the data will fall out of control limits. By comparing process data against these lines, we can draw conclusions about whether the process variation is in control or is out of control. Before diving into programming world, let’s use Excel RND function to create random dummy data which will be used later to plot control chart. Suppose that the random number represents 20 high school students’ height and will fall between 158 and 180. By running following code, we can get 20 random numbers. 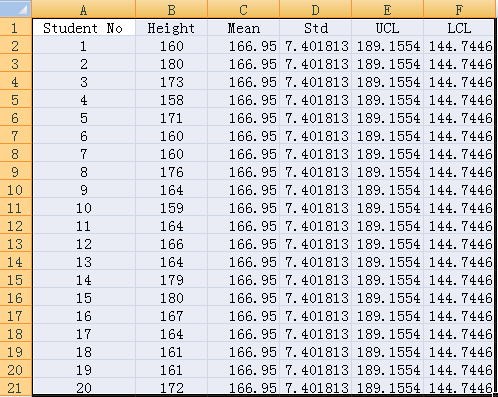 Worksheets(1).Cells(1, 1) = "Student No"
With the sample data that we just created, we can use below code to compute mean, LCL and UCL of sample data which will be used to draw central line, lower line and upper line, respectively. We use formula to compute statistics so that values of mean, standard deviation, LCL and UCL can change automatically once we run DummyData to change sample data. Cells(i, 3).Formula = "=Average(" & "B2:B" & nlast & ")"
Cells(i, 4).Formula = "=StDev(" & "B2:B" & nlast & ")"
Cells(i, 5).Formula = "=Average(" & "B2:B" & nlast & ") + StDev(" & "B2:B" & nlast & ")*3"
Cells(i, 6).Formula = "=Average(" & "B2:B" & nlast & ") - StDev(" & "B2:B" & nlast & ")*3"
Here shows how the data looks like and data may vary from time to time when running above code. So far, we have all data essential for control charts and now let’s move on to the most important part – how to draw control charts using VBA programming. First of all, we need to declare a ChartObject object. The ChartObject object acts as a container for all the elements of a chart. Let’s call it myChtobj but you can use any name. Here display the methods (together with examples) that we will use to manipulate myChtobj object. 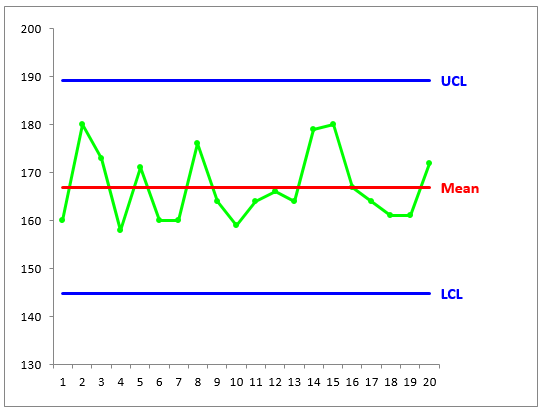 Now let’s try to create elements such as the series graph, central lines, UCL and LCL lines and put them into the chart container. Chart.SeriesCollection.NewSeries method is available for use. Following shows how to plot series graph. By repeating adding new series using above approach, we can get a graph like below. However, it looks ugly. First of all, we need to remove data markers from central line, upper line as well as lower line and change the foreground color of the series. Here gives you some methods to change series and markers properties. In order to remove markers, we can just set value of MarkerStyle as xlNone. After formating,we can get following graph. Obviously, it is still not beautiful. We need to change legend, axis, and chart itself. There is a little trick when coming to determining y-axis scale. Mod function can be applied to automate the computation of max value and min value (see below in red for details). Please note that we need to take both source data, UCL and LCL into consideration when trying to compute maximum scale and minimum scale. Cells(2, 7).Formula = "=max(" & "B2:B" & nlast & ",E2)"
Cells(2, 8).Formula = "=min(" & "B2:B" & nlast & ",F2)"
And I also present the output above. It looks much better. But I still want to delete legend and insert text next to lines. However, the plot area will become wider than before without legend. Therefore, we need to retrieve the current width of plot area before removing legend and then re-size plot area’s width as before. This can be done by the following code. But what about inserting text which is near line? We can use the data value label of last marker point to display text what we’d like to show. Here is the code showing you how to change properties of marker point. Finally, the completed graph is something similar to below. It’s awesome, right? Here you can find all the code. Please note that we need to do an examination before starting plotting data because the data should be normally distributed when using control charts. Otherwise, the chart may signal an unexpectedly high rate of false alarms. Very interesting, however, control charts are meant for daily data input…the chart should update automatically….can you present one with daily input and automatic chart update? I use control charts daily and have problems with this, also Mean	Std	UCL	LCL must be in one cell and not in every entry..
Hi Sew. Thanks for your suggestions. I will write another post later when I am free.